PROVIDE, the independent men’s lifestyle shop in the Custard Factory is pleased to present the first screening of the PROVIDE Cinema series, featuring films that explore and question the world around us. 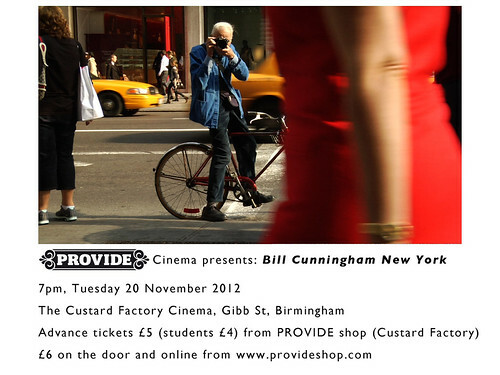 On Tuesday, 20 November at 7pm in the Custard Factory theatre we will be showing Bill Cunningham New York, the highly acclaimed documentary about Bill Cunningham, the originator of street style photography from New York City. The film paints an intimate portrait of a shy man living a modest lifestyle who has become a key figure in New York fashion and high society circles as a result of his candid street photography. Tickets are £5 in advance (£4 students) from the PROVIDE shop in the Custard Factory, or £6 on the door and online.